Using frozen ready prepared bases makes this recipe so quick and easy. You just have to decide how you like your eggs done. Preheat the oven to 220°C, gas mark 7. Wash the spinach then place in a saucepan and cook for 2-3 minutes until it has wilted. Drain well and season to taste. Spread the spinach evenly between the pizza bases. Top each pizza with 3 slices of loosely folded Serrano ham, and the artichokes. Scatter the cheese and oregano over the top. Make a slight indentation in the centre of each pizza to allow room for the egg to be added later. Cook the pizzas directly on the oven shelf for 8 minutes, then remove from the oven and crack an egg into the centre of each pizza. Cook for a further 8-9 minutes depending on how well-done you like your egg. Serve immediately, with a tomato and basil salad. 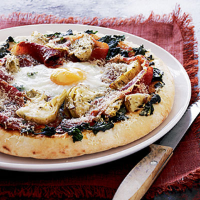 Waitrose stone baked pizza bases are great for topping with tasty leftovers - why not get creative? Raw/semi-cooked eggs are not suitable for pregnant women, elderly people, or those with weak immune systems. This recipe was first published in October 2008.